Do you often snore when you are sleeping? You should not be ashamed because it is the habit of many people. It is a common problem. Snoring is the action of breathing noisily from your mouth and nose due to the vibrated airway tissues while you are sleeping. Although it is not a serious problem, it always bothers the persons around you. It makes them feel uncomfortable. Imagine if you try to sleep whereas your partner is snoring noisily. How do you feel? You should not so worried whether or not if you are suffering from this problem because it is very common among people, especially men. About 40% adults often snore when they are asleep. Furthermore, our article will suggest you some effective home remedies for snoring introduced below. There are some main reasons explaining why you snore. Overweight is one of the first causes of snoring. Obesity means that the fat around your throat increases, thereby leading to the narrowness of your air passages. As a result, your breath is obstructed while you are sleeping. Menopause is the second factor causing you to snore. It is because women often gain weight when they come in their menopause. As mentioned above, the heavier you are, the more you snore. When you become older, usually at the age of 50 and above, your throat is narrower. You will find more difficult to breathe freely. As a result, you often snore when you are asleep . Snoring often occurs in men rather than women. It can be explained that their air passages are narrower than those of women. The difficulty in breathing can be the result of nasal blockage. When you get a blocked nose, you are more vulnerable to suffer from snoring. Some other factors include drinking alcohol, smoking and using some kinds of medicines. In order to find out what natural remedies are suitable for you, firstly you have to know what type of snoring you are in. Mouth snoring: There are 2 small types of mouth snoring. They are mouth based one and tongue based one. The former happens when a person breathes through the mouth more than through the nose. The later occurs when the airway is blocked because of the falling of the tongue into the throat’s back. 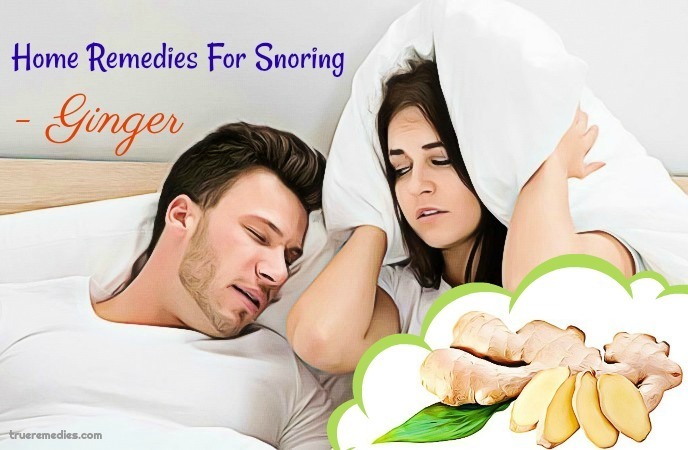 Nose snoring: You can suffer from nose snoring if your nose is stuffy. The nasal congestion leads to the blockage of the air passages. As a result, you snore when trying to breathe . 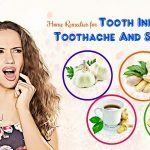 Peppermint is used as a natural remedy for many kinds of health issues, including easing stomach aches, alleviating headaches, strengthen our energy, clearing up the respiratory tract, etc. Peppermint is listed one of the top home remedies for snoring because of its wonderful benefits to treating snoring. With its anti-inflammation power, peppermint is so effective in alleviating the swollen membranes in your throat line as well as nostril line. As a result, you find it easier to breathe. It is so effective if your snoring is due to dry air or an allergy . Pour about 2 drops of peppermint oil in a bowl. Use the mixture to gargle before bedtime. Note: Do not swallow the mixture. Add some drops of peppermint oil in the humidifier. Turn on it after half an hour when you go to bed. Apply a small amount of peppermint oil to the 2 sides of your nose before bedtime. Olive oil has a number of benefits to our health. 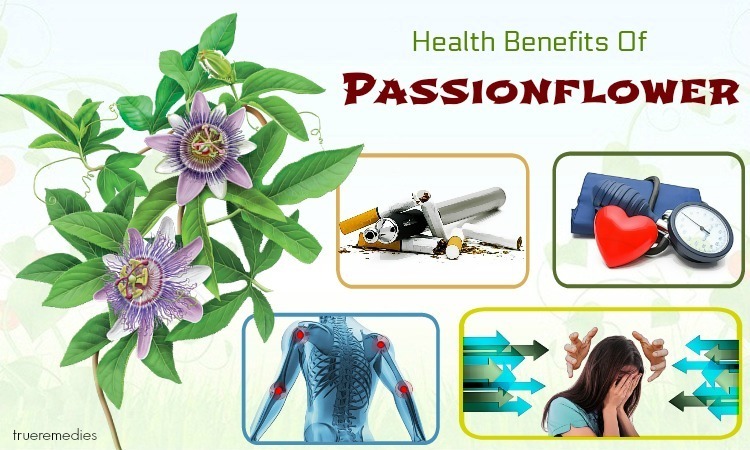 It helps to combat against and aid in treating many kinds of health diseases, including obesity, diabetes, heart problems, etc. 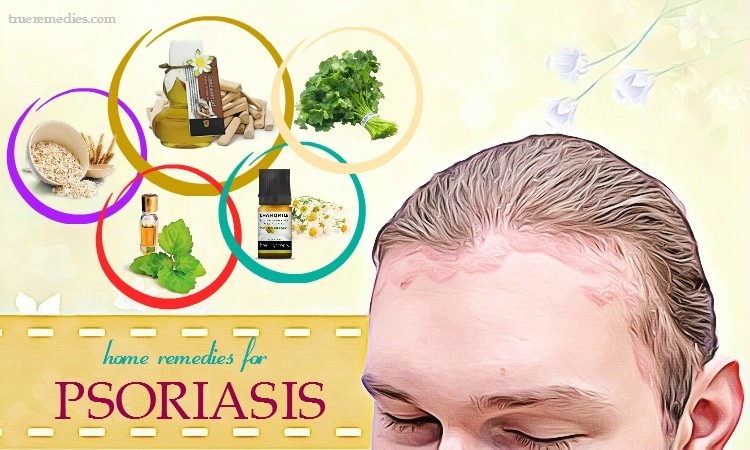 It is so effective in treating skin problems. As to snoring, it works so well to improve this condition . Thanks to the strong ability to treat inflammation, olive oil is used effectively to soothe the tissues of your air passages, alleviating swollen membranes. Therefore, you can breathe easily. In addition, it helps to ease the soreness and reduce the vibration of your breath when you are sleeping. As a result, you can treat your snoring. Sip an amount of olive oil before bedtime every day. Take ½ teaspoon of olive oil. Consume the mixture before bedtime every day. Steam may be the simplest and most effective for treating a stuffy nose. 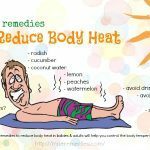 In addition, this method can be used to easing a cold, reducing pain and aches due to a number of health issues. If your nose is blocked, you can snore when you sleep. As we all know, one of the best way to remove a nasal blockage is inhaling steam. Pour some hot water in the bowl. Drop a little tea tree oil in the bowl. Cover your head with a clean towel. Breathe the steam in for about 15 minutes. Do this process every day before bedtime. Clarified butter, or known as ghee, has a lot of benefits to our health. Firstly, it contains a number of soluble fat vitamins, such as A, E, K which are necessary for our brain and bone development as well as help to strengthen our immune system. As the same as steam, clarified butter owns its particular property which can contribute to clearing up your nasal blockage. More specifically, it helps to ease snoring and sleep easily. Put some clarified butter in a bowl. Put the plate in a microwave oven. Then, add the butter which is warm in a dropper. Drop two drops of the butter in your nose. Apply this method every day every morning and evening. One of the best home remedies for snoring that we have to mention is cardamom. It is the most common spice in cooking. Thanks to containing plenty of vitamins, such as vitamin A and C, minerals, including calcium, magnesium, it is so beneficial to our heath. It can give a hand in improving our digestive system, maintaining our heart health, cancer prevention, etc. It can help to solve digestive problems as well as is considered as a detoxification. Playing the role as a decongestant, cardamom is so effective in helping your blocked nose to open up. The air passage is not blocked and you will snore less, accordingly. Take ½ teaspoon of cardamom powder. Consume the mixture half an hour before bedtime. Turmeric is considered as one of the best ingredient available in the kitchen for treating a number of health issues. It aids in preventing Alzheimer’s disease, cancer, boosting our immune system as well. As to snoring, turmeric can reduce the inflammation, preventing you from snoring thanks to its antiseptic property. 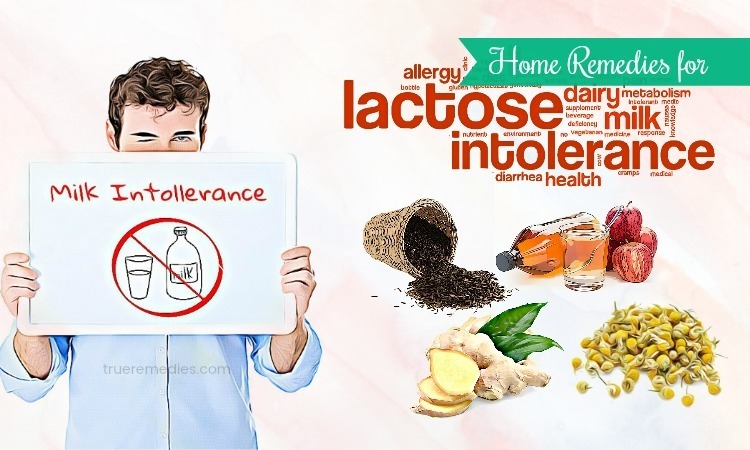 Combination of turmeric and milk can help you breathe easily. Take about 2 teaspoons of turmeric powder. Add some warm milk to the bowl. 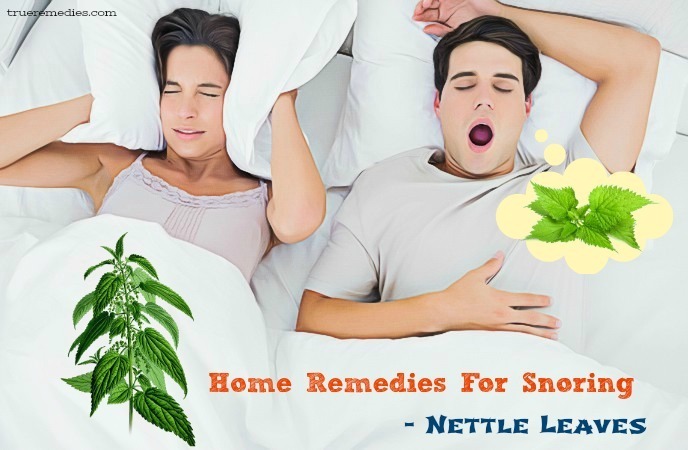 If you snore because of an allergic reaction, you can simply save yourselves from this annoying problem by using some nettle leaves. Containing the ability to combat against inflammation and its strong antihistamine power, they can help you to reduce the inflammation, contributing to clearing your nasal blockage. As a result, you can breathe freely and don’t snore any more. If your snoring is caused by seasonal allergy, thereby inflaming your nasal passages, you should not ignore this wonderful herb. Take a tablespoon of nettle leaves which are dried. Add some boiling water to the glass. (A cup is sufficient). Then, let the leaves steep for a few minutes. Consume the tea when it is still warm before going to bed. 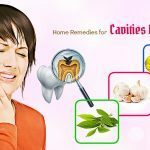 Garlic is not only a good spice for increasing the flavor for dishes, but also one of the natural ingredients for treating many kinds of diseases. Garlic is also one of the best ways to combat against snoring. Firstly, it is because garlic has its ability to eliminate the mucus in your nasal passage. Secondly, it is really good at reducing the inflammation in your air passage. These help you to breathe freely, preventing you from snoring. Peel it and chew it. Apply this method every evening before going to bed. Add garlic to your daily dishes. Honey is another natural ingredient which helps you to alleviate your snoring. Thanks to its anti-inflammatory power, it can give a hand in easing a swollen throat. In addition, it can contribute to lubricating your throat, limiting your snoring. Put a tablespoon of raw honey in a glass. Add some lukewarm water to the glass. Consume the mixture every night before going to sleep. Add honey to peppermint tea or any kind of your favorite tea. Consume every day after you finish your dinner. Simply enjoying a cup of chamomile tea brings you surprising result in treating your snoring. Owning its anti-inflammation properties, the tea can reduce snoring while sleeping. It also has its ability to relax your nerves and muscles around your throat, encouraging you to sleep well. Boil the water for about 20 minutes. Add a little raw honey to the tea. Consume the tea every evening before bedtime. 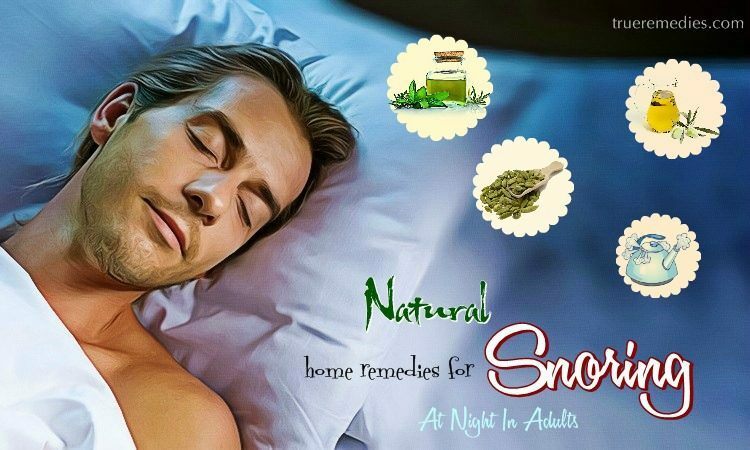 You can try sage herbal as a natural way to combat against snoring. It works well to control snoring because it contains anti-inflammatory and anti-microbial powers which help to treat the inflammation as well as clear up the congestion of the airways. If these problems are solved, your snoring is reduced, accordingly. Add some boiling water to the pot. Also, add an amount of apple cider vinegar. (2 tablespoons are sufficient). Then, take a large enough towel to cover your head and the pot. Stop inhaling the steam when the water is not warm any more. Allow the mixture to steep for about 20 minutes. Let the mixture cool down naturally. Consume the mixture every night before bedtime. Note: Don’t apply this remedy for the persons suffering from seizure disorders. If you are trying to reduce your snoring, you should not miss out this wonderful oil. 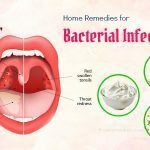 It is a traditional way for treating snoring because the oil owns a number of properties which are so effective in reducing snoring, such as the ability to combat against microbes, viruses and fungi. Pour about 5 drops of thyme essential oil in a cup. Also, add the same amount of coconut oil in the cup to dilute the thyme oil. Mix them on your feet at the bottom. Do this remedy every night before going to sleep. Note: Don’t use thyme essential oil if you are suffering from high blood pressure. Also, it is not advisable for breastfeeding and pregnant women, as well as the children under 6 to apply this method. Ginger can be known as a magically natural medicine for many diseases thanks to its ability to fight bacteria and inflammation. As to snoring, it helps to encourage your saliva to produce much to wet your throat, limiting the risk of snoring when you are asleep. Put the crushed ginger in a pot. Allow the mixture to steep for several minutes. Add some raw honey to the tea. Consume about 3 cups of the tea every day. Snoring may be caused by your sleeping position. Sleeping with your head at high position can help to make you find it easier to breathe, preventing you from snoring. Simply, you can use a thick pillow to solve your snoring. In addition, if you have a habit of sleeping on your side and you often snore when sleeping, it is your sleeping pattern that cause you snore. When sleeping on your side, your throat’s back may be pressed by the tongue, blocking the airway and causing you to snore, accordingly. So, you should change your sleeping habit to reduce snoring. As mentioned in the reason of snoring, a stuffy nose can account for snoring. That is the reason why if you use saline to clean your sinuses every night before going to bed, you can eliminate your snoring. All you need is a nasal strip or a neti pot. Smokers have higher risk of snoring than non-smokers. Smoking can make the membranes in your throat and nose becomes irritating, blocking your air passages and leading to snoring. So, it is clear that, you can prevent yourselves from snoring by quitting smoking. Plus, smoking is listed as one of the reasons causing you to face the nasal congestion . Alcoholic drinks can cause you not to breathe freely. As a result, the risk of snoring is higher. Exercise can be considered as one of the best natural home remedies for snoring because exercise helps you to relax your throat muscles, easing your breathing easily. Say vowels out several times every day. Spend a few minutes for each vowel. Keep your mouth close and make your lips to purse. Keep this status for about 20 seconds. Sing as much as you can. Reading this tip, you may raise a question why I snore while I am not fat. In fact, it is not true that only fat people snore. Thin people also snore, too. However, if you are fat, your throat can be pressured, causing you to snore when you are asleep. In this case, it is a good idea for you to make a plan for losing your weight step by step. This will help you to reduce snoring, accordingly . A bad sleep hygiene can lead to snoring as the same as smoking alcoholic drinks or smoking. If you often work for long hours without taking a rest every evening, your body doesn’t have time to relax. You will feel so tired and stressful. If you are so tired, you can sleep everywhere possible, which is one of the reasons why you snore. Therefore, you should have a deep sleep every night so that your muscles can have time to relax. Your sleeping position should be the pattern that you feel comfortable most. All these factors will help you to prevent you from snoring when sleeping. 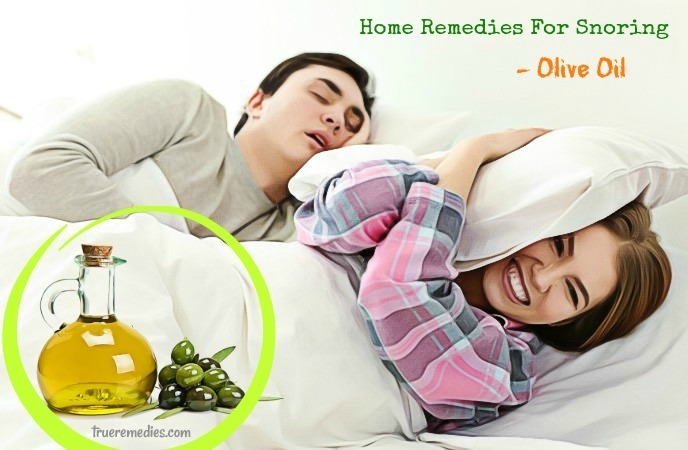 The best home remedies for snoring are collected in our article of “19 home remedies for snoring”. 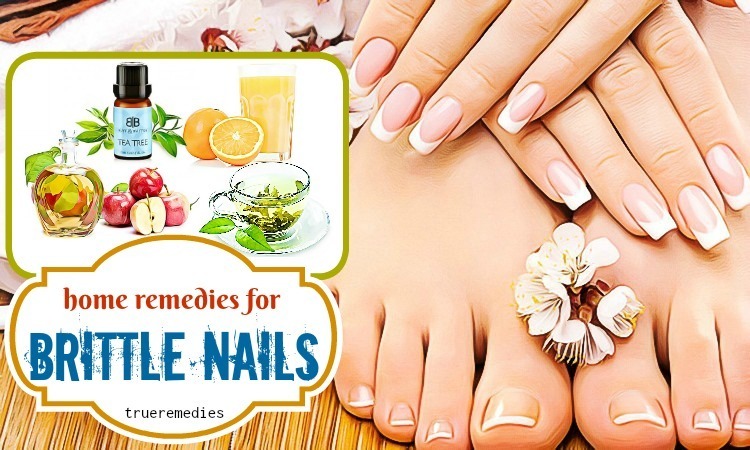 Now it is time for you to choose the most suitable remedy for yourselves. Remember that if your snoring doesn’t improve, you should go to see a doctor to find a better solution for your snoring. 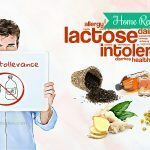 If there are any concerns about the remedies mentioned in our article of “25 Home Remedies For Snoring At Night In Adults” introduced in Home Remedies Category, feel free to leave your comments and questions under this article. We will try to give the feedback to you as soon as possible.